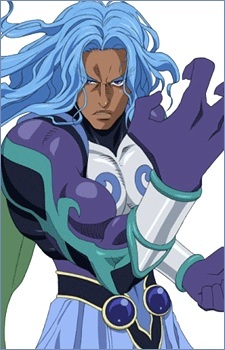 Barbatos is a warrior who fought in the War of Heaven and Earth; he was killed by Dymlos. His power was equal to the Swordian Dymlos, but due to his own selfish behavior, he was written out of history. Now, Barbatos fights in order to validate his existence; he is motivated primarily by negative emotions: his lust for revenge against Dymlos, his desire to seek out worthy opponents in battle, and his selfish demand for recognition as a powerful warrior in the War of Heaven and Earth. Barbatos has been resurrected by Elraine to kill Stahn and his allies, to ensure that they will not interfere in the rise to power of Elraine and the goddess Fortuna. An axe is his weapon of choice, and Barbatos assaults the party with a fierce combination of physical and magical skills in battle.